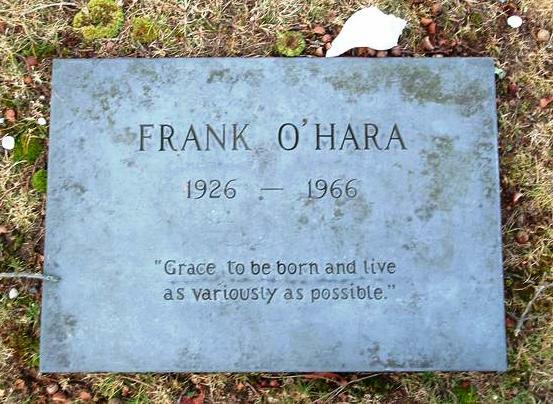 It seems like a good moment, then, to revisit some of the many elegies written for O’Hara, and there are quite a few. As Marjorie Perloff once noted in her landmark book on O’Hara, “a whole anthology could be compiled of poems written for Frank O’Hara in the five years or so following his death.” She wrote those words in 1977, but no one has yet compiled such an anthology (not to mention one that also gathers the countless poems written for and about O’Hara in the years since), but someone should! You’re in a bad mood? And then there’s the elegy that is perhaps my own favorite: James Schuyler’s devastating poem “Buried At Springs” (Springs being the name of the town in Long Island, NY, where O’Hara is buried, just a step away from his hero, Jackson Pollock). It is not like this at all. and Paris (“changing to rain”). the harsh russet of dried blood. * Apologies for not getting the spacing of these Ginsberg lines right: try as I might, I can’t seem to get WordPress to allow me to space lines of poetry correctly. (If anyone has any suggestions, please let me know!). This entry was posted in Allen Ginsberg, David Shapiro, Frank O'Hara, James Schuyler, John Ashbery, Marjorie Perloff, Poems, Ted Berrigan. Bookmark the permalink.